The members of the Nichols Hills Fire Department are united to excel in the delivery of services for life, health, and property conservation, through effective public and personal education, with an eye toward the future and the changing needs of the community. Ensure an adequate response to emergency incidents. Expand public relations and education to improve life safety and property conservation. Enhance community service by increasing teamwork through improved interdepartmental relations. Maintain a high level of employee physical and mental fitness thereby increasing safety and reducing injuries. 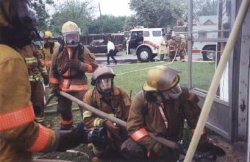 Purchase quality, reliable, state of the art, equipment and apparatus to satisfy the needs of the community. Provide a higher level of pre-hospital care, increasing the number of lives saved and reducing the extent of injury.